"According to the preliminary data, five people have died [as the result of the earthquake], material damages have been sustained," the President said at the press conference. Pena Nieto added that his country had just experienced largest earthquake in the last 100 years. "It is estimated that 50 million Mexicans felt the tremor," the president said, according to El Economista news outlet. The impact of the earthquake was felt in the city and state of Mexico, the states of Chiapaz, Veracruz, Hidalgo and several others. Pena Nieto also reportedly said that 65 aftershocks were felt after the earthquake. 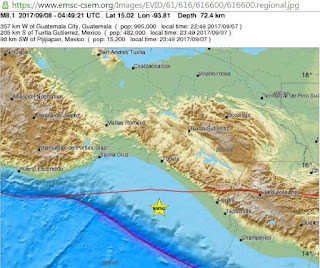 Earlier in the day, a magnitude 8.2 earthquake struck off the coast of the Mexican state of Chiapas, near the border with Guatemala. It was followed by an aftershock with a magnitude of 5.7. A tsunami warning was issued following the quake. The death toll from an 8.2-magnitude earthquake that hit Mexico has reached 15, according to the head of the country’s Disaster Management Agency. “The death toll is 15 in all... based on the figures from each state,” Ricardo de la Cruz, head of the Disaster Management Agency, told Milenio TV. At least 58 people have been killed and more than 250 injured is the preliminary balance of the strong earthquake that struck Mexico and parts of Central America on Thursday, the largest tremor suffered by this country since 1932.